People living in or cycling through Hackney: the consultation is here, there’s an exhibition of the plans on Tuesday, a Hackney Cyclists meeting on Wednesday and Hackney Cycling Conference on Friday. This is a post prompted by something apparently minor: the loss of less than a hundred metres of cycle track. It’s delaying my promised discussion of what cycling can learn from London’s bus priority network. But it’s important being a sign of a larger malaise to which the more general discussion will speak: the continued failure to mainstream inclusive cycling (outside the highest-profile cycling schemes), even apparent in London’s highest cycling borough. The current track along a short section of Wick Road. 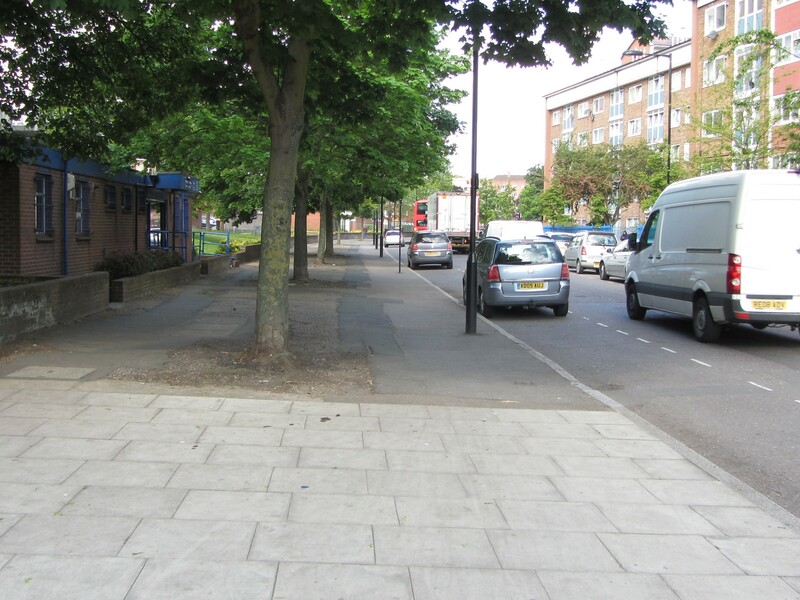 Recently I was shocked to hear about plans to rip out a cycle track in Hackney. 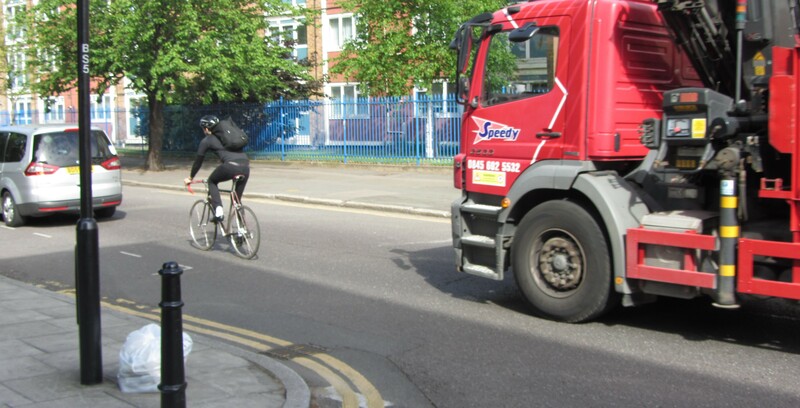 It’s part of the London Cycle Network and provides a safe crossing route across and along part of a busy B-road carrying many thousands of motor vehicles each day, including a good number of HGVs (involved in five out of six cycle deaths in London this year). I know this track well; it’s on my commute. It provides a safe connection on a signed route for people cycling down past Homerton station and continuing South, to some of our beautiful parks (Well Street Common, Victoria Park). Or for me and others, a way to continue West and join the reasonably good Seven Stations East-West route into town and to work. I’d hoped what I’d heard was a rumour, but sadly, it’s true. People couldn’t believe it when it was shared on social media, asking ‘why would they do that?’ In Hackney, where more people cycle than drive to work, on a London Cycle Network route. The Wick Road plans, showing the safe crossing and track section to be replaced by tiny on-road advisory lane and dangerous turns. The main focus of the Wick Road scheme is to reintroduce two way motor traffic, turning it from a busy one-way road into a busy two-way road. Along the way, the cycle track will be ripped out leaving people using this route riding along a road that is and will remain completely unsuitable for mass cycling. The track is not long, but solves a problem that many Quietway-type routes face. What to do when the nice quiet street hits a big road? And worse, when the quiet street continuation is a few hundred metres along, with the busy road forming a major barrier to what should be a low-motor-traffic route? Luckily, Hackney had solved it quite well. Continuing South, from Barnabas Road, you hit a useful and appropriate ‘bike box’ – because with motors one-way on Wick Road, there’s no left hook risk. You cross safely over Wick Road onto the track, then turning right and riding along the track, before getting to the Southbound continuation, Bradstock Rd – a very quiet one-way street with a contraflow track. The Wick Road two-way track enables you to continue, from quiet-ish street to contraflow track, without having to deal with the motor traffic on Wick Road. Returning Northbound, the reverse operation is equally easy. The route continues up Bradstock Road. This is exactly the kind of solution that Quietways must include whenever needed, if the term is to have any meaning. 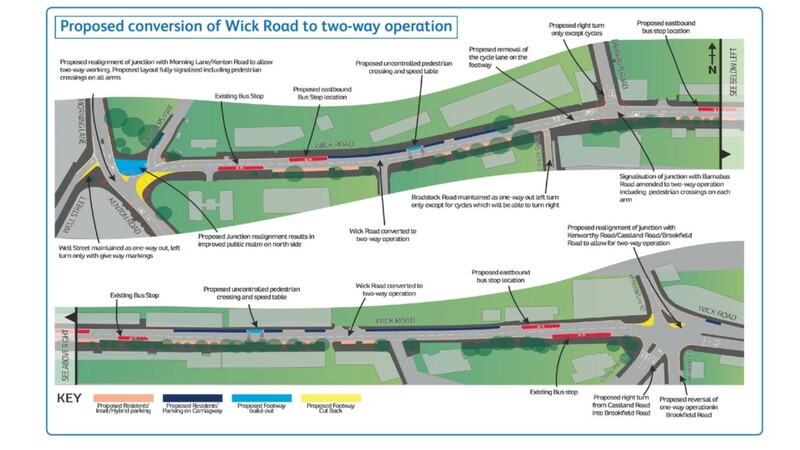 Removing the track is wrong and a backwards step, as Wick Road two-way will, under the present plans, be no more suitable for inclusive, all-ages cycling than Wick Road one-way is today (not at all). 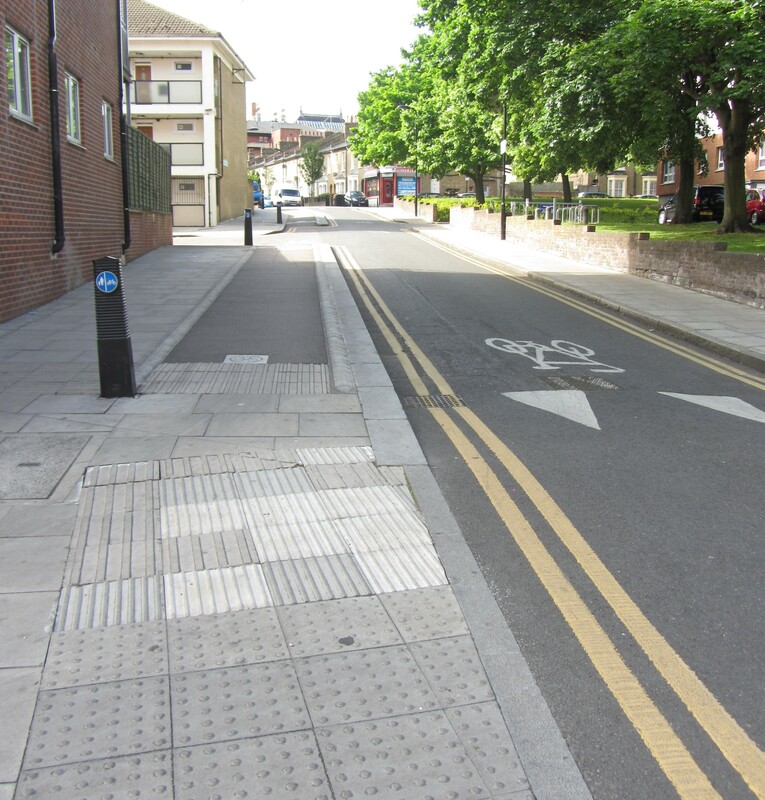 Sure, it’ll be unpleasant for cycling in two directions: but is that really the best Hackney can do? And if the cycle track is ripped out the connection between Barnabas and Bradstock Roads – part of the official cycle network – will become not just unpleasant but unsafe. It will predictably lead to injury at some point. Close-up of the plans showing the cycle route from Barnabas Rd to Bradstock Rd, where protected space will be removed. Because I know this, I will personally avoid the route if the track’s ripped out: but someone else without this knowledge or without alternative choices will at some point not be lucky. This is what you currently have to do to continue Westbound along Wick Rd, because the track stops. It doesn’t feel like these proposals have been much thought about with cycling in mind, let alone run through a tool like TfL’s Cycling Level of Service and Junction Assessment Tool. I find it extremely disappointing in Hackney, where I’ve lived for 15 years. Cycled here for 12. Studied it for two years as part of the Cycling Cultures project. I love the place and hesitate to be publically critical, as in this blog post. Those who know the borough’s reputation as an ‘anti-segregationist hotbed’ may be surprised to learn that it inspired my work developing LCC’s 20mph-2000PCU policy (saying that cycling needs segregating on core routes unless both motor vehicle speeds AND volumes are very low). I’ve seen it argued that Hackney’s success in getting cycle commuting rates up to 15% (mode share more like 5%) shows that we don’t need segregated cycle provision. On the other, I’ve heard the argument that it’s nothing to do with infrastructure of any type, it’s just demographics – Hackney’s bearded hipsters who jump on a cycle or even a penny farthing at the drop of a hat. (Re-watching Nathan Barley it reads like an early premonition of this). 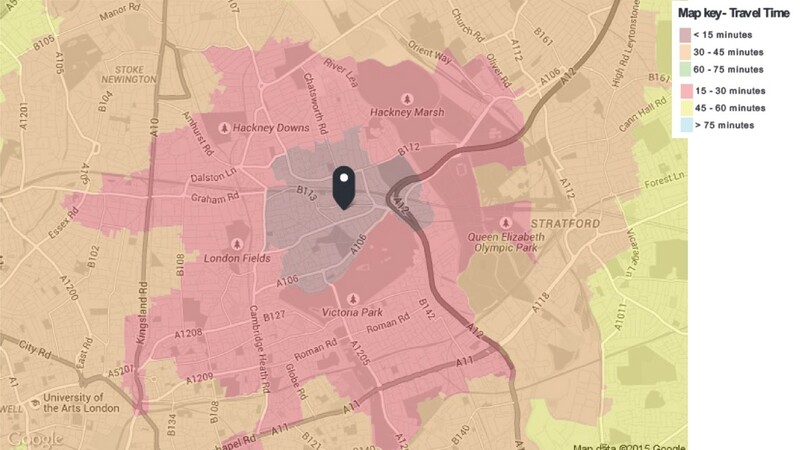 Cycling potential is much greater in Hackney among women, young and older people. The second argument is a bit odd when you think about it. It relies on the assumption that 30 year old men are ‘natural cyclists’. Look at who cycles in The Netherlands, Germany, Denmark, and it’s not 30 year old men who are the ‘low hanging fruit’ for cycling. It’s kids, old people, women and men alike (sometimes more women) – while there’s a dip in cycle use in young adulthood as people get cars. In Hackney (and London more broadly), by contrast, the evidence shows cycle commuting dominated by men aged 25-35, even though they often have longer commutes than other groups. I created this graph tabulating the proportion of Hackney resident commuters travelling 5km or less, against cycling to work rates. It’s stark. 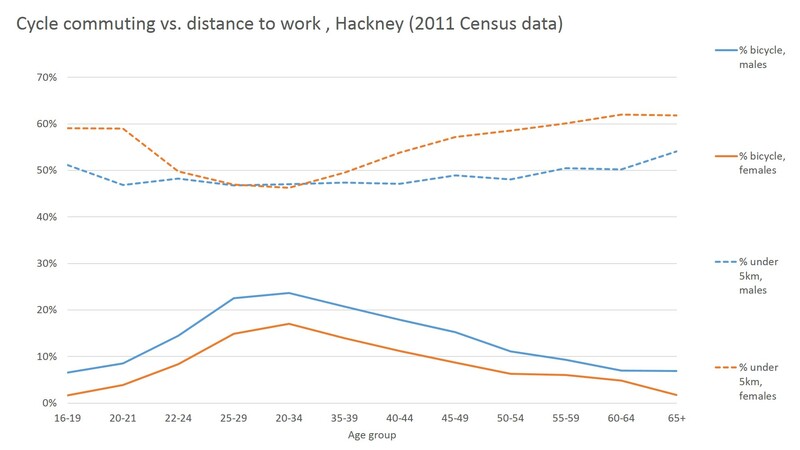 You can see that if Hackney wants to continue and create a truly mass cycling culture, we need to stop focusing on the thirtyish men – nearly a quarter of whom already cycle to work, despite relatively long commutes – and begin focusing on over 35s and under-25s, and particularly women. Some of these groups have cycle commuting rates as low as 2%, which indicates a cycling system still failing to meet the needs of the majority, and – in my view – building still for Mr. LTN 2/08. 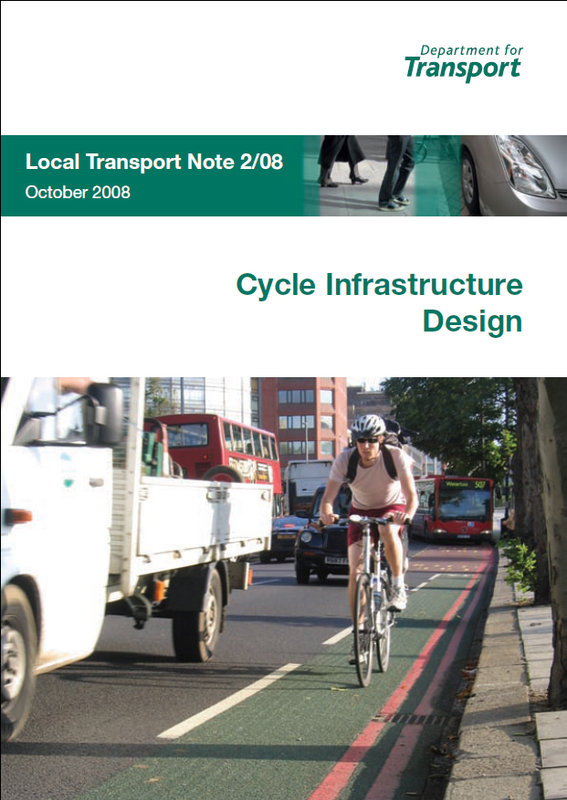 LTN 2/08, the cover of our national infrastructure design guide. Casts a long and pernicious shadow. The integrationist argument – that Hackney shows there’s no need to build specifically for cycling – is also leaky. It doesn’t give the local authority enough credit for policies encouraging cycling, which have actually often relied on separation of modes. OK, there are some fortuitous factors – relatively low severance by major road and rail (compare Newham for example) and the river and canal. But also, Hackney Council has done more than most to separate cycles from motor traffic. It just hasn’t usually done so on Hackney’s main roads, which remain no less cycling-hostile than others across London. To be fair, quite often these main roads are managed by Transport for London, so it’s not primarily the borough’s fault. And up until very recently, no one in London (or indeed beyond) – TfL or boroughs – was building much decent provision on main roads, so it’s not like there were better UK examples, or comparators where good tracks did exist. However, aside from main roads, Hackney Council has separated motors from cycles with – in a London context – relative zeal. Cyclists can ride through pretty much all of Hackney’s parks – something lacking in most London boroughs and even in Copenhagen (where, to be fair, the cycle tracks on nearly all the city’s main roads are actually better for cycling anyway – and pedestrians don’t have large numbers of fast cyclists in ‘their’ space, which might otherwise be a problem). Hackney has used Dutch-style techniques like opposing one-ways (with cycle contraflows) and modal filtering (removing through motor traffic using bollards and planters, while retaining cycle permeability) in some residential streets. Some of the nicest cycling I do in London uses streets like this. There should be many more of these in Hackney and elsewhere, but it’s clear this is an effective and inclusive form of separation from motor traffic, like cycle tracks. So for me, Hackney’s success is partly due to the long-term impacts of incrementally separating motors from cycles. It also showcases the current limits of the London model – so far – because you can see the problems that remain. Cycle deaths and injuries continue as elsewhere, because cyclists inevitably end up on unprotected main roads at times, which put them at risk. Filtered streets are concentrated in affluent areas of the borough, where residents have campaigned for them; there’s big differences in cycling rates when you compare small areas. And of course it’s poorer areas where separated cycle provision (by filtering and tracks) is most needed; where lack of car ownership is a problem rather than a solution, people struggle to afford bus fares, and often the big roads cause particular severance issues. For example, the estates along Wick Road. Ripping out the track is terrible, and it should be stopped. But even if the track is kept, the scheme is still failing the people who need cycling most. Not me and my fellow existing cycle commuters, nipping along a small section of Wick Rd on our way to work, so much as the broader local population living either side of Wick Road, often in estates with low car access, and limited public transport access. For example, here’s a graph from TfL’s excellent WebCAT service, showing how long it takes by bus in the am peak to get places from the middle of Wick Road. Even for relatively short trips (e.g. to the shops of Stoke Newington in the North of the borough) you’re often looking at 30-45 minute journeys, which could be done in half the time by bike. If people on Wick Road had a better cycling environment, they’d not only save some money now spent on a car or public transport, but also get places faster. For local adults and children, it should be possible – even easy, and fun! – to jump on a bike and cycle the direct route down Wick Road to the local shops, schools, and restaurants, and beyond. The severance is bad here, in the relatively impoverished East of the borough. Wick Road is the middle of three East-West roads, all of which are unpleasant, uncomfortable and unsafe. Homerton High Street to the North (a TfL road) has already killed one cyclist this year. Cassland Rd (like Wick, Hackney-managed), Wick Road’s evil sister, runs in the opposite direction. Like Wick Road it has an injury record, is unpleasantly busy, and to add insult to that, cycling on the main carriageway of Cassland Road forms part of the London Cycle Network. Wick Road and Cassland Road are big problems in the local area. They obstruct movements on bike and on foot, causing air pollution and injuries. So it would be lovely to see Hackney Council putting forward a vision for the people who live there; the kids in car-less homes (over 60% of households in Wick ward) who aren’t allowed to cycle because of traffic risk, whose asthma is aggravated because of all the fumes. Cycle track aside, it is so perverse here to prioritise adding Eastbound to Westbound motor traffic, when there’s so much more that could be done. Making Wick Road two-way will make life easier for through motor traffic, i.e. drivers accessing the M11 link road to the motorway, but will do little to improve local people’s lives, maybe even increasing the throughput of motor traffic. The improved pedestrian crossings are very welcome but not essential to the project; they could be done separately at much lower cost. 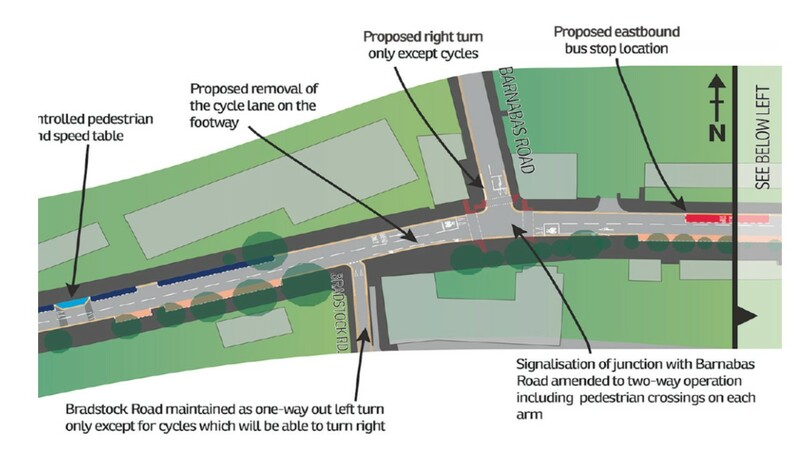 I think that removing the one-way system (a) is not what cycling advocates should be calling for, and (b) shouldn’t be what the Council – which of course has a multi-modal focus – prioritises here either. There are many important issues here and housing most obviously springs to mind. But transport matters too – and it’s sad that in a progressive cycling borough, cycling isn’t seen as part of the equality picture, but rather – it too often feels – as something for the privileged. Part of the problem is the language we’ve inherited. Debates around transport inequality construct cycling as being like car travel: if people can afford a bicycle, it’s assumed the access problem is solved. It’s not thought of as being like a transport service. But for most people living on or near Wick Rd, the current lack of connected safe and comfortable cycle routes is equivalent to lacking a bus service. We need to think of cycling as something that, enabled through collective provision of infrastructure, can like public transport transform life chances, allowing many people but most importantly disabled and older people, low-income people, children, and many others to be mobile in a way they never would otherwise. We know that women, older people, and children are disproportionately excluded from cycling if we expect people to share with HGVs along roads like Wick Road. Making Wick Road as a whole safe for comfortable cycling is a firm move in the direction of greater equality, providing people who need it most with real access to cheap, healthy, flexible transport. And perhaps some of those very short commute distances found among Hackney residents reflect limited opportunities; why aren’t we thinking about cycling infrastructure as enabling people to safely and healthily access a wider range of jobs and services? 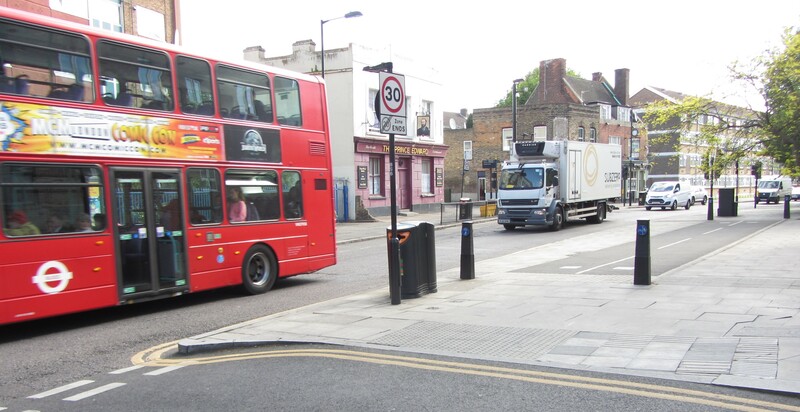 If, rather than having a vision for ‘normal’ two-way motor traffic functioning along these main roads, we really prioritised residents’ access to walking, cycling, and public transport – in that order, as per Hackney’s own transport strategy – we’d have a different starting point. Two-way motor traffic might come back to Wick Road – it’s pretty wide after all – but only if it benefited walking, cycling and public transport more than the associated disbenefits. And it might well not be the first thing you’d do with limited time and money. The footway continues westbound, towards a local shopping area with a market; cycling is illegal here. At the moment, cycling is clearly losing out, from an already poor position. Pedestrians are getting better crossings (and unlike cycling keeping segregated space) but that could happen anyway. Two-way buses will use Wick Road, but, far from being an unqualified boon, a friend living on a Wick Road estate (non-cyclist, non-car driver) tells me he and his family feel two-way traffic would make matters worse, with the extra throughput of buses increasing the motor traffic problem they already have, and with the potential for more rat-running by cars on unfiltered side streets. An aside here: the same friend said he felt a bit nervous about potential conflict with cyclists on the track, although he added he’d never experienced or seen any actual collisions. The track in fact is on the part of Wick Road that’s most likely to lead to pedestrian-cyclist conflict, as it’s the route to the station: further East or West there’s often lower pedestrian flows and/or wider pavements. So continuing the track along the rest of Wick Road would certainly be no more problematic than the current situation, which – despite there being some pedestrian discomfort, as I’d acknowledge – according to Stats19 data hasn’t led to any reported injuries in any pedestrian-cyclist incidents over the past 5 years. In fact, if Hackney Council built a track along the entire length of Wick Road, they could take the opportunity to reposition the existing stretch (either as one, two-way track or two one-way tracks). If positioned nearer the road – perhaps even by taking some motor traffic space – it could be better placed to accommodate the growing numbers of local cyclists you’d expect a track to generate, without causing pedestrian stress. Coherent, consistent two-way cycle provision along the length of the road could also mean pedestrians and cyclists coming to expect each other more and so coexisting more happily along Wick Road. Like Cambridge, what Hackney does matters for everyone: people elsewhere are looking to Hackney for a lead. I’d love to see Hackney embracing cycling for all, moving to the next level and asking “what do women, disabled people, children, young and older people need from routes, to get them cycling in much greater numbers?” (I could perhaps help a bit there.) Even though it’s important, I don’t think it’s enough just to leave the existing small section of track. We should be building more tracks on busy roads like Wick Road, whether motor traffic is to be two-way or one-way, also extending Hackney’s successful provision of space for cycling in residential streets and in parks. Hackney has done a lot of good stuff. It’s time to move to the next level, not to slip backwards. Enjoyed a very considered article. One thing to add: An improved East/West corridor could link Hackney Central with Hackney Wick/Olympic Park and beyond, without ‘going up the hill’ to Homerton. Would also benefit north-east/south-west cycle traffic. Am sure a cycle friendly traffic engineer would have a field day sticking in segregated tracks to Dutch guidance with such huge building-to-building widths. After all, on as busy roads there is little prescient that I know of for on-road cycling when there is ample room for segregation. And surely being able to cycle to the shops of Well Street and on to Hackney Central, or the other way to the Olympic Park on a quiet route or segregated track would be encouraging to non-comuter type cyclists. Junction to east of Wick Road and under A12 would need VERY careful consideration however. I am a resident of Brookfield Road I cycle to the city to work everyday via Victoria Park/Columbia Road etc. We have a weight limit on Brookfield Road which is not enforced it took 4 years to get. For Brookfield Road this scheme is perfect as the road will be turned round so up hill and no lorries , many cats have been killed on Brookfield Road and cyclist already come up the road against the one way traffic. Change.org have started a petition to stop two way Wick Road yet the residents want this change it will ease pollution and once in force Hackney will look at cycle routes in the next budget. There is a shared footway along Victoria park Road for the winter when the park is shut, this works very well.